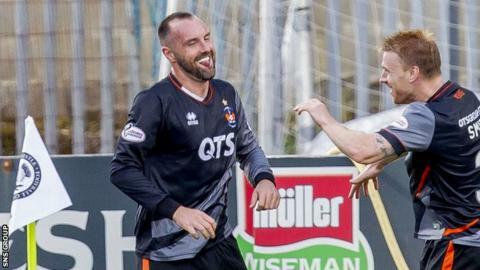 Kris Boyd retains a fierce appetite for finding the net, according to Kilmarnock assistant boss Peter Leven. The striker, 32, scored his first goal since returning to Killie in a 2-2 draw with Partick Thistle and Leven was pleased for his former team-mate. "I am delighted he got that goal and it was a great header," said Leven. "He is a big asset for us. He has been here twice before and done very well and hopefully he does it the third time too." Leven returned to Kilmarnock this summer in a coaching capacity, having played for the Ayrshire side between 2004 and 2007, overlapping with the first of Boyd's spells at Rugby Park. "I've known Boydy for years and he is a goalscorer," he added. "He always has been and he still has the hunger and desire. "Boydy always want to score goals, even in training." Killie are searching for a first Premiership victory of the season but Leven has been heartened by recent displays. "The last two games have been really good," he said of back-to-back draws with Thistle and Celtic. "It is getting there, it's starting to click and hopefully we can get that first win, especially at home. "You don't want to see your name at the bottom of the table but it is early in the season." Kilmarnock face Ross County this weekend and Leven is aware of the threat the Staggies will pose. "Football changes so quick," he explained. "Ross County have signed some very good players and spent a decent amount of money as well. "They like to pass the ball and press so it will be a tough game but we are at home and we have to take the game to them."